The Fisher Museum's main exhibit displays 23 internationally acclaimed models (dioramas) portraying the history, conservation and management of central New England forests. Browse a 1936 booklet describing the dioramas' construction. Download high-resolution images of the dioramas. Other exhibits at the museum represent the range of ecological research at the Harvard Forest. Outdoors, our system of interpretive trails provide additional opportunities for learning. More than ten thousand dams were built on New England rivers over the past four centuries. In the last two decades, intentional removal of these structures has become common throughout our region, motivated by public safety, maintenance costs, and the desire to restore passage for migratory fish. 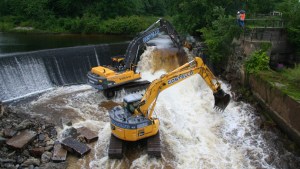 This presentation will review the history of dam construction and removal in our region, and describe results from a ten-year study following the removal of the Merrimack Village Dam on the Souhegan River in New Hampshire, one of the best-studied dam sites in the country. The presentation will also touch on local examples, and close with lessons learned about sediment management following dam removal that apply to stream restoration projects throughout our region. The Fisher Museum is closed on Harvard University holidays. On summer and fall weekends, we rely on a group of committed volunteers to keep the Fisher Museum open to the public. Learn more about volunteering at the Fisher Museum.